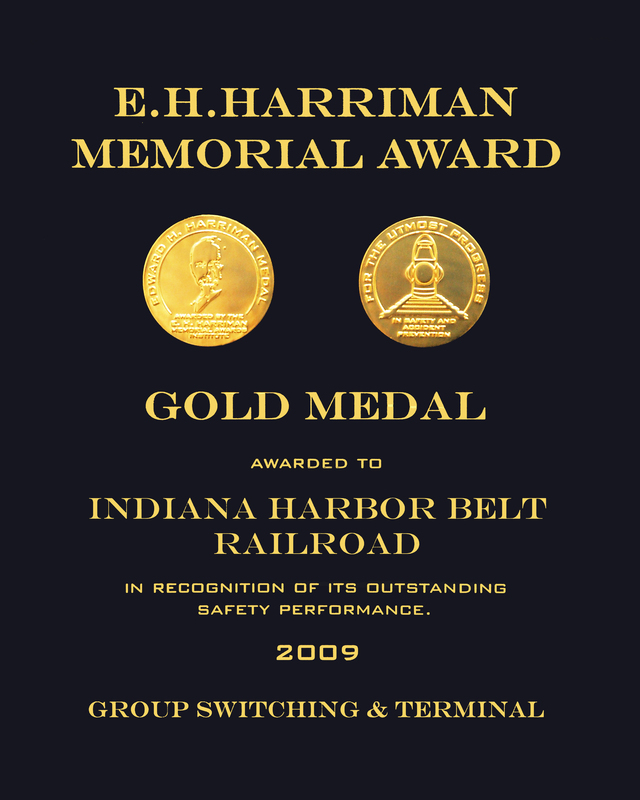 WASHINGTON, May 12, 2000  The Indiana Harbor Belt (IHB) received an E.H. Harriman Award Certificate of Commendation for its continuing improvement in employee safety over the past two years. The E.H. Harriman Awards committee presented the 1999 Awards in Washington, DC to representatives from the IHB. Representing the IHB were Eugene A. Franiak  Locomotive Department Laborer and NCF&O President & Local Chairman, Donald G. Geib  Trainman and Safety Committee Chairman, Kenneth B. Hartley - Locomotive Engineer and Safety Committee member, William D. Hitchcock - Track Supervisor and Safety committee member, Frank D. Jurgensen  Customer Service Field Representative, Charles H. Allen, IHB General Manager, and Louis J. Mayden, Manager of Safety and Environmental Health. Certificates of Commendation are awarded to railroad companies to recognize continuing improvement in employee safety over a period of at least two consecutive years, and also for specialized activity which contributed significantly to an improved safety performance. The E.H. Harriman Memorial Awards were founded in 1913 by the late Mrs. Mary W. Harriman in memory of her husband, a pioneer in the railroad field. The Awards are presented for outstanding performance in railroad safety and as a continuing stimulus for the conservation of human life. For many years, the program was carried out under the sponsorship of two sons, Mr. E. Roland Harriman and The Honorable W. Averell Harriman. The Awards are being continued under the auspices of the E.H. Harriman Memorial Awards Institute, with support from the Mary W. Harriman Foundation.